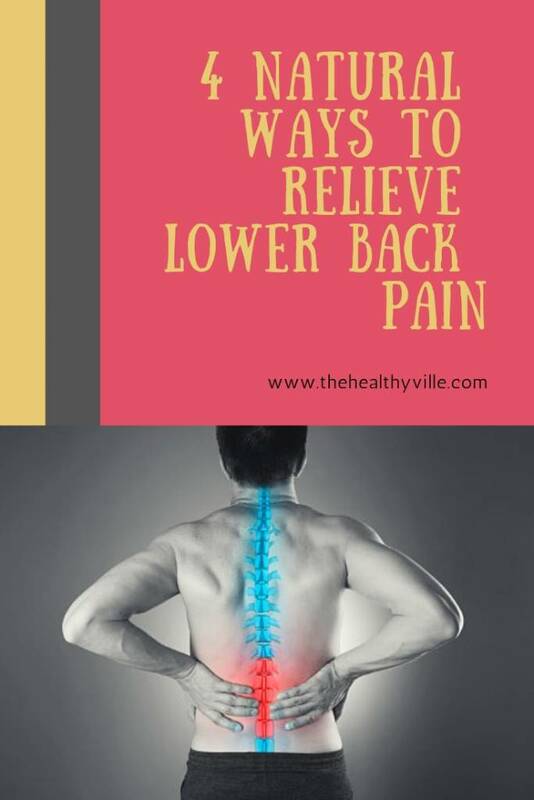 When looking for ways to relieve lower back pain, it is convenient to combine different methods in order to obtain the best benefits of each one and thus accelerate the healing process. One of the discomforts that adults suffer most often are back pain. Be it in the lower, middle or high part, they can be really intense and constant. However, the one that causes the greatest problems on a day to day basis is low back pain. It is estimated that 80% of adults experience pain in the lower back, at least once in their life, looking for different ways to relieve back pain. That is why, it is considered one of the main problems that cause disability in the world, according to the American Chiropractic Association of the United States. The statistics of this organism indicate that more than half of the working population of this country has reported back pains annually. This situation has caused people to seek to alleviate discomfort with different methods, including natural methods. The lower part of the back is subject to great tension, since it always carries the weight of the upper area. In general terms, the weight of the upper body is supported by the spine, its stacking vertebrae and the discs that compose it. These discs function as a shock absorber to prevent the bones of the vertebrae from touching each other. However, with age, they tend to wear out, tear or injure themselves. This wear occurs over time, due to overwork or bad movements. It causes temporary pain or stiffness and, in some cases, chronic pains that notably affect the daily routine or the well-being of people. The individual works doing activities of great physical effort that involve uncomfortable movements or postures. The affected person remains seated in his office without making many movements. Further info: This May Be The Hidden Cause Behind That Pain In The Lower Back You Have! In all cases, it is important that you consult your doctor to identify what is a real problem. Identifying the reason for back pain in a patient is difficult, despite the techniques and technological advances that currently exist. However, the process is necessary to receive adequate treatment. Fortunately, with some natural methods you can avoid the interruption of daily activities and relieve back pain. On the other hand, you should keep in mind that visiting the doctor to receive a diagnosis is very necessary. These treatments should be taken as an alternative to relieve symptoms and not as a definitive remedy. An effective natural therapy to relieve low back pain is the direct application of cold and heat. These changes in temperature help reduce inflammation or promote blood flow in the area affected by injuries or forced labor. Even by the tension acquired by maintaining a posture for a long time. You can place cold compresses, ice packs or gel covered with a towel directly in the area of ​​pain to reduce inflammation. To help with blood flow, use warm water compresses or warm water baths. This relaxes the muscles and eliminates discomfort. Garlic has important anti-inflammatory properties to soothe low back pain. It can work as an effective natural remedy to soothe low back pain. This is because it has very effective anti-inflammatory properties, due to its allicin content. The easiest way to use it to relieve this pain is by eating it raw. You can also use it as a topical analgesic. For this it is necessary to apply a garlic-based oil. Put your pan on heat and add oil to it. Then add the garlic cloves. Let them cook over very low heat until they turn brown. Then strain them and store the oil in a glass container. You can also do it in cold, adding the garlic to the oil and leaving it to marinate for 5-10 days. To relieve muscle and lower back pain, exercise is a good natural therapy. You can start with a wellness plan to relieve back pain in which daily exercise is included. Low-impact exercises (such as light stretching, swimming or walking) are good for avoiding stiffness in the area. The sedentary life affects much the muscles that are in the lumbar part of the back. With exercise you strengthen them and prevent them from suffering more injuries. The stronger they stay, the fewer the ailments. An adequate rest allows to recover the physical form of the lumbar area. Adequate compliance with physical rest can be the solution for many health problems. When sleeping, endorphins are released. These hormones can be just as effective as pain medications. When the body produces endorphins, the pain signals that register in the brain diminish a little. Restful sleep relieves the anxiety, stress and depression associated with chronic low back pain. People who suffer from back pain, in general, also have some sleep disorder. Sleeping badly can worsen the symptoms of low back pain. It is important to solve both evils to avoid a vicious circle that harms health. In any case, it is necessary to seek professional medical advice. Don’t forget to SHARE the natural ways to relieve lower back pain with your friends and family on your social networks!